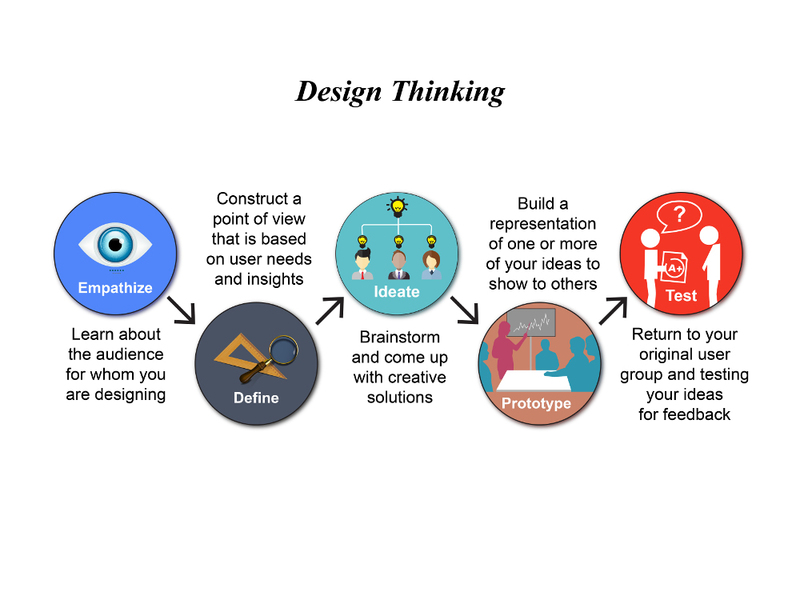 Design Thinking is developed at the Stanford d.school. 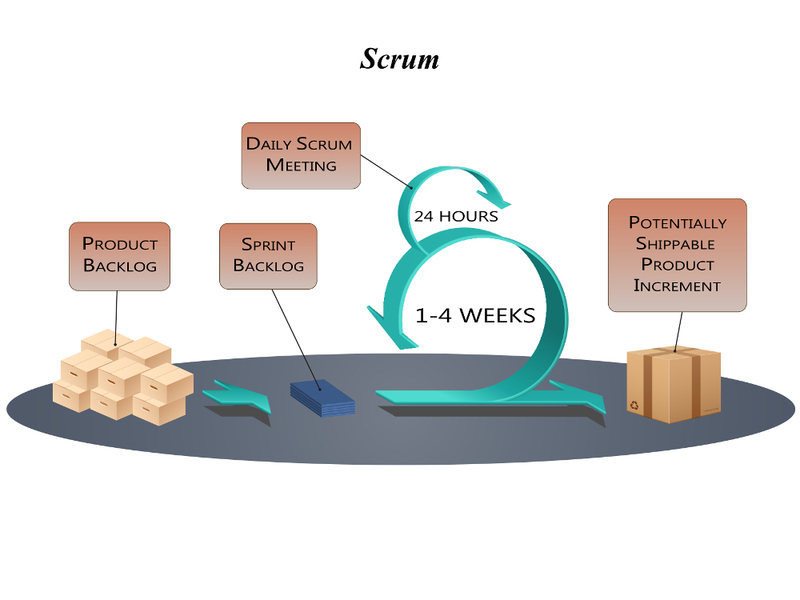 It is a process that allows individuals to implement new strategies to solve problems. This process focuses on understanding, creating, critical thinking, implementing and testing. It’s a continuous process of learning and improving upon initial ideas. Empathy: It is the starting point. It encourages us to ask great questions. Learn about the audience to whom we are designing for. Identifying risks, obstacles. It is done through observation, interaction, and collaboration. Define: It is about defining the details of the issue based on knowledge from empathy. It is to determine what will make the project successful. Identifying the needs and motivations of end users. Ideate: It is a brainstorming session. One should generate as many ideas as possible to serve these identified needs. Come up with a wide variety of possible solutions and explore a range of ideas. Prototype: This is stage of Creation. Implementing your ideas into a physical form to show others. Test/Feedback: Get feedback from a different group of people including end users. Review your solution and determine if it meets your goals. Discuss and learn more about the user and refine your ideas. 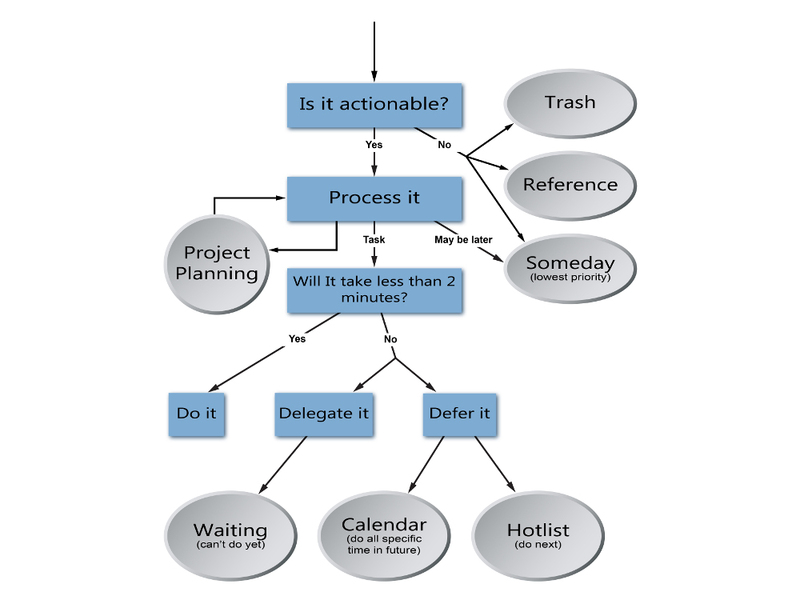 Getting Things Done, known more often by the colloquial shorthand GTD, is a process created by David Allen in his 2002 book entitled “Getting Things Done: The Art of Stress-Free Productivity”. Through his research, Allen has come to the conclusion that accomplishing tasks requires breaking down larger, more complex goals into more actionable work items by moving these larger goals out of one’s mind. Designed to help workers focus on taking action rather than the stress of recalling the work required on larger tasks, GTD ensures the most attention possible is given to the task at hand. 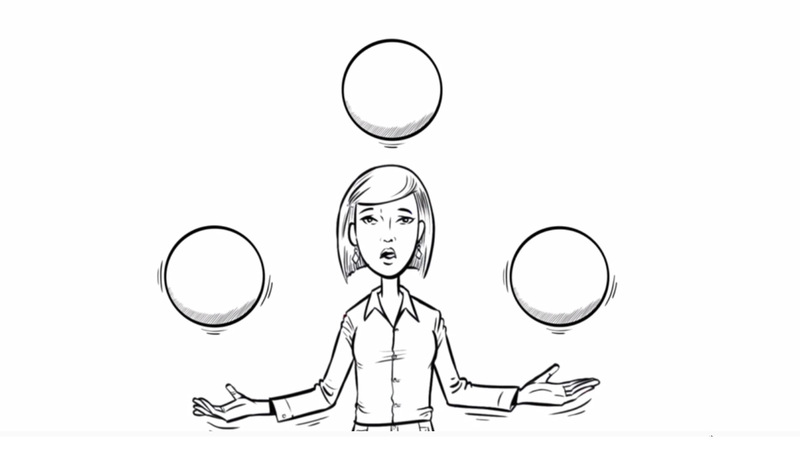 The GTD process requires an emphasis on two key concepts: control and perspective. By using a workflow method designed to control the amount of work to be done and breaking it into reasonable, manageable tasks, employees are in a better position to accomplish more. GTD simplifies perspectives into six separate horizons of focus: current actions, current projects, areas of responsibility, one to two year goals, three to five year goals, and life. Instead of working from the top down, GTD works from the bottom up, starting with the smallest horizons in order to work toward the larger ones. Unlike normal human focus, which requires internal reminders, GTD focuses on external organization systems that the brain cannot misinterpret. Workflow under GTD requires a categorization approach that encompasses five stages: capture, clarify, organize, reflect, and engage. By taking each responsibility or action and capturing its necessity, clarifying the objective, organizing the proper approach, reflecting on what needs to be completed, and taking action, it’s possible to make quick work of any task.